Whenever you type “=” after an expression involving range variables, Mathcad shows the computed values in an output table. 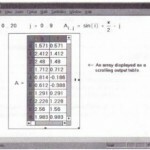 Figure 11-2 shows the values of several range variables displayed as output tables. • a number, if the result is a scalar (a single number). • a vector or a matrix, if the result is a vector or a matrix and the expression to the left of the “=” contains no range variables. 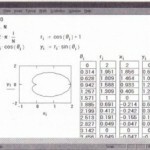 • a table like that shown in Figure 11-3 if the expression to the left of the “=” contains range variables. • Mathcad shows only the first 50 values of a ranged expression in a table. For example, even if i ranges from 1 to 100, typing i A 2 = will show only the values from 12 up to 502 in a table. To see more than 50 values, use several range variables and several tables. You could, for example, define}1 from 1 to 50 and}2 from 51 to 100, and then show tables for j 1 A 2 = and j 2 A 2 =, side by side. • There are three ways to show the values in a vector. If you use a vector name with a subscript like Xj =, Mathcad shows an output table. If instead you type a vector name without a subscript like x =, Mathcad shows the vector as a vector rather than as an output table. 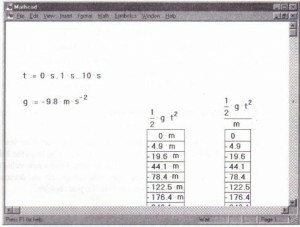 If you type a vector name without a subscript and the vector has more than nine elements, you see a scrolling output table as described in the section “Displaying vectors and matrices” in Keep in mind that these are just three different ways of looking at the same thing: an ordered collection of numbers. • You can’t use units with a table as you would with a single scalar answer. 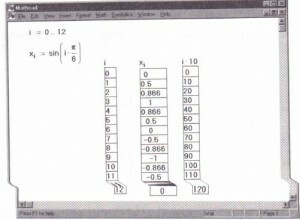 If the results in a table have dimensions, Mathcad shows dimensions on each value in the .” table. 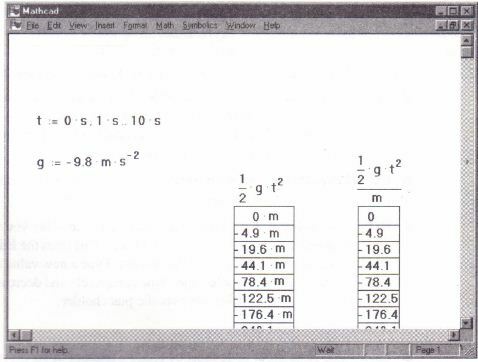 To avoid this, divide the ranged expression by the units. See Figure 11-4.